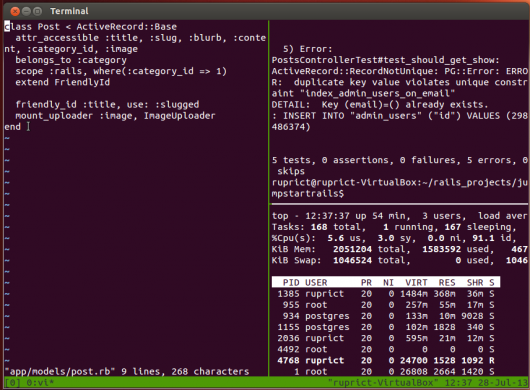 Learn more on ruby with our tutorial Setting Up Automated Testing with RSpec on SitePoint. I first learned about tmux from Evan Light (@elight) when I engaged him topair program with me eons ago. I was stunned at how easy tmux made it for Evan and I to collaborate in real-time. My reaction was a bit like an unfrozen caveman. I marvelled at the technology, presuming only advanced beings, like Evan, could wield such power. I put it on my “Someday” list and went back to my stone tablets. In all likelihood, you’ve probably already heard of tmux. However, you may not be using it everyday. If tmux is on your “Someday” list because you think it is too complicated (I mean, c’mon, the word “multiplexer” is just plain scary), then I am here to show you just how easy it is to put tmux into your workflow. Use Homebrew. brew install tmux and you’re done. It is not a huge deal if you cannot get 1.8 or don’t want to go through adding a PPA. You’ll just miss out on one of the cool features added in 1.8, which I will explain later. No dice, unless you use Cygwin or install a VM with a *nix distrubution and then follow the instructions for Ubuntu. Type the following to make sure all is well. 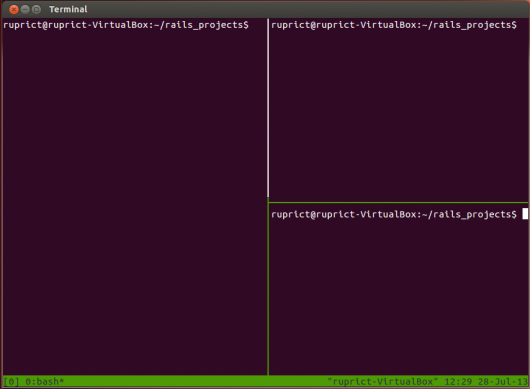 Using tmux is as easy as typing tmux. When you do that, it just looks like your screen clears and you’re back at the same terminal prompt. A bit anti-climatic, maybe, but you’ve just stepped through the looking glass. The more observant among you will notice that the terminal how has a green bar along the bottom. If you are thinking that this is a status line for tmux, you’d be right. Right now, it tells me the date, time, the host, what “windows” are open (just 1 named “0:bash”), and the name of the session (“0”). When you start tmux with no arguments, it names the session using a zero-based list that increments by one for every current tmux session. As you might have guessed, you can name your sessions whatever you like, but we won’t get into that today. The status bar can also be configured to display more information, use different colors, and many (MANY) other things. In this article, however, we are only going to focus on windows and panes. I’ve already mentioned words like “session”, “window”, and “pane”. When you run tmux, it creates a new tmux session. A tmux session is, put simply, and container for windows and panes. A window contains one or more panes. Each pane and each window are a virtual terminal, it just happens to be that windows can contain panes. Panes and windows can swap places, as well, so a pane can be made a window and window can be made a pane. When starting life with tmux, I’d recommend you split your terminal into 1-3 panes for an “edit” window, and run other processes (like a rails console or tailing a log file) in their own windows. That is what we will walkthough today. Let’s do this. Fire up a terminal and cd into the root of your application. 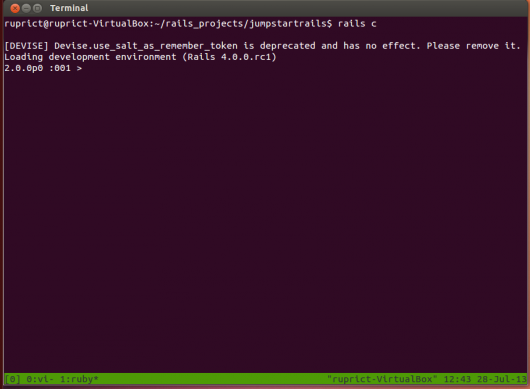 I am using a Rails app here, but that is not important. Whoa! That key-combination is a bit cryptic, no? It is, but that’s OK. Learning the tmux commands is no different than learning anything else, and they can be easily changed. It is worth noting,however, that the CTRL+B portion of that macro is called “the prefix”. CTRL+B is the default prefix for tmux, but you won’t be surprised to know that most people change it. 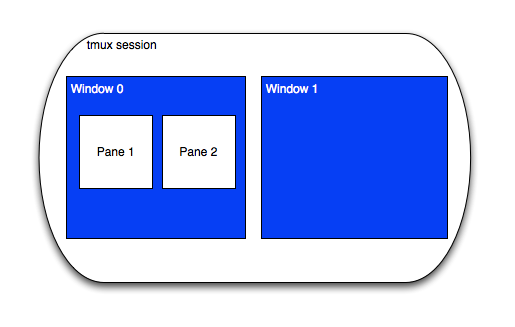 With the panes setup, the commands for each pane need to be launched. Since your cursor is now in the bottom, right-side pane, type top and watch top fire up. OK, switch to the top, right-side pane and type a command. For me, I’ll use rake test, but I would generally make this pane run the automated tests using guard or something similar. Same prefix, new suffix to the command. This one makes a bit more sense; to move up, use the up-arrow. Now type the command to fire up your tests. Can you figure out how to move to the left-side pane? Once you do, launch your editor. I use VIM, so I type vim. I LUUUUUV this feature, because it means I can full-screen my tests when they are failing and navigate around that pane more easily, then return it to its original size when done. You are now in a pane-free (HA!) terminal and the status bar shows two windows (0 and 1). Fire up the rails console or whatever you like here. where is 0 or 1. Now you can jump back and forth at your heart’s consent. where -t stands for “target” and 0 is the session name. Now, go ahead and detach again. This will end the session, so if you do another tmux ls, you will see zero sessions running. By the way, if you exit out of all the windows in a session, the session will exit as well. This article just skims the surface of what tmux can do for you. However, you can apply what you learned today and be more productive in your development environment without investing another second of time learning about tmux. Buy the Tmux Book and read it. It’s great. Create your .tmux.conf file and start changing tmux to suit your needs. There are LOADS of examples and it makes tmux even better. Check out tmuxinator for setting up named tmux environments that fire up a bunch of panes and windows in a new session with a simple command. 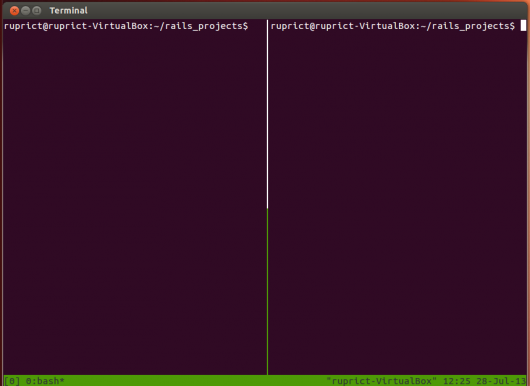 Pair program with someone using tmux as the way to collaborate in real-time. It’s mind-blowing. 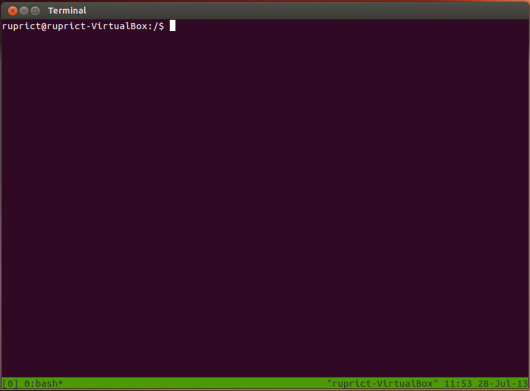 The goal of this article was to get you going with tmux in as simple a way as possible. I am now at the point where I start tmux up to do just about everything. I love convenience of splitting a window into panes and running a quick command without leaving my current window. I think you’ll find it just as useful.